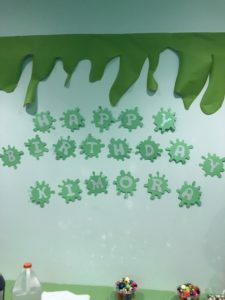 Kimora’s Slime Themed 10th Birthday Party; The Best/Worst Idea EVER! Kimora’s slime-themed 10th birthday party; parents consider this a warning, you’re welcome in advance. I love parties. I’m all for going all-out and doing the absolute most in the name of fun. My daughter, Kimora, got a big birthday for her the big TEN! I had to go all out for her. When my oldest daughter turned ten, I turned my upstairs into a spa for her and friends, they got pedi’s, little robes, face masks you name it! It’s only fair that I show Kimora the same birthday love. Kimora chose her birthday theme… in hindsight I should have immediately said no, but I’m stupid. SLIME. (I know parents, what was I thinking)? !Clearly, I wasn’t. The first half of her tenth birthday party would consist of ice skating and pizza. Afterward, 13 girls came back to our house for a slime-themed sleepover. I told Ms. Whitney, our nanny, the theme and she went all out! Slime banners, intricate chalkboard slime signs, nothing but the best for Kimora. I went on Amazon and ordered every slime mixer you can think of! Slime beads, perfume, snowflakes, charms, glow in the dark mixers, bright colored cubes, glitter, it was a slime enthusiast’s dream! Different colored glue, borax, shaving cream, SLIME MANIA. Ms. Whitney really went all out with the handmade decorations! A little backstory. Slime isn’t even allowed in our house! Haha. As a matter of fact, when we were living in a rental we had to replace the carpet due to slime and when we moved into our new home Kimora ruined her room chair the first week we moved in! I can equate it to childbirth, all the memories of ripping from head to toe and being in excruciating pain fade after a while. The same went for slime, all the damage was forgotten when it was time for a slime-themed party. It was cool at first, they were all very dialed in on making the perfect slime. I go upstairs for about ten minutes and when I come down I almost passed out. My husband and I thought we had covered every slime angle but forgot about one thing… THE KIDS CLOTHES! When I say some girls were COVERED in slime, I mean it. Slime was spilling out over the bowls onto the chairs, floor, other peoples coats, their clothes, I was MORTIFIED! It was like watching a horror movie in slow motion. What in the world had I done? Their parents are going to KILL ME!The tables looked like someone had thrown up rainbow slime all over them. Some girls had slime in their hair, on their face, any place where slime could be, it was! I just kept saying “Oh my god” over and over. There wasn’t much else I could do. If anyone knows about slime, you know IT DOESN’T WASH OUT OF CLOTHING. “You might as well attach a gift card to each outfit.” Where’s the Target sponsorship when you need it? Haha! After vinegar, scrubbing, and washing clothes there was for sure some stains. But every parent was such a good sport when I told them I let their kid make slime and I ruined their clothes. 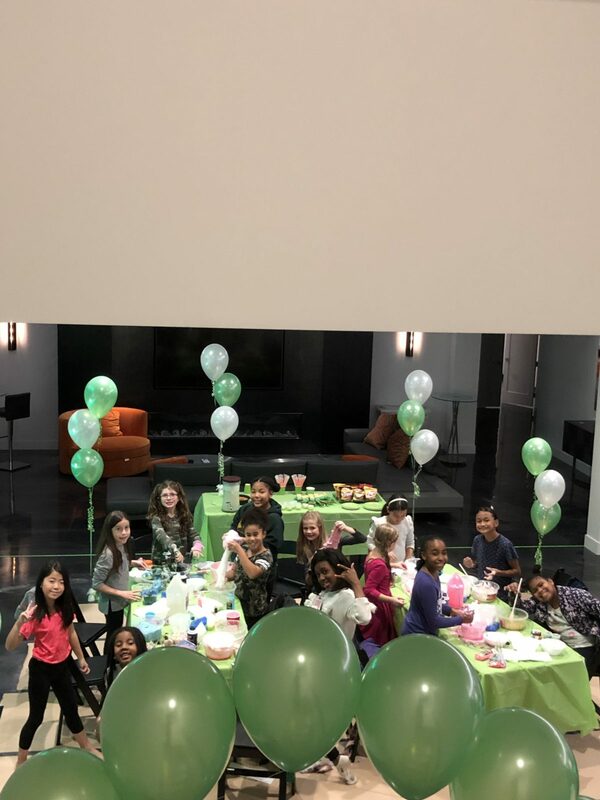 All in all, Kimora’s tenth birthday was memorable for more reasons than one. The girls had a blast making slime, a mess, and memories. Aside from the mishap the party was killer! Parents, your gift cards will be mailed soon. Haha! How to deep-fry the perfect Thanksgiving turkey! If I can do it, you can too!